From time to time, I try to give my readers recipes so you can use up all those eggs your hens lay. Alas, I am not a chef – not even close! 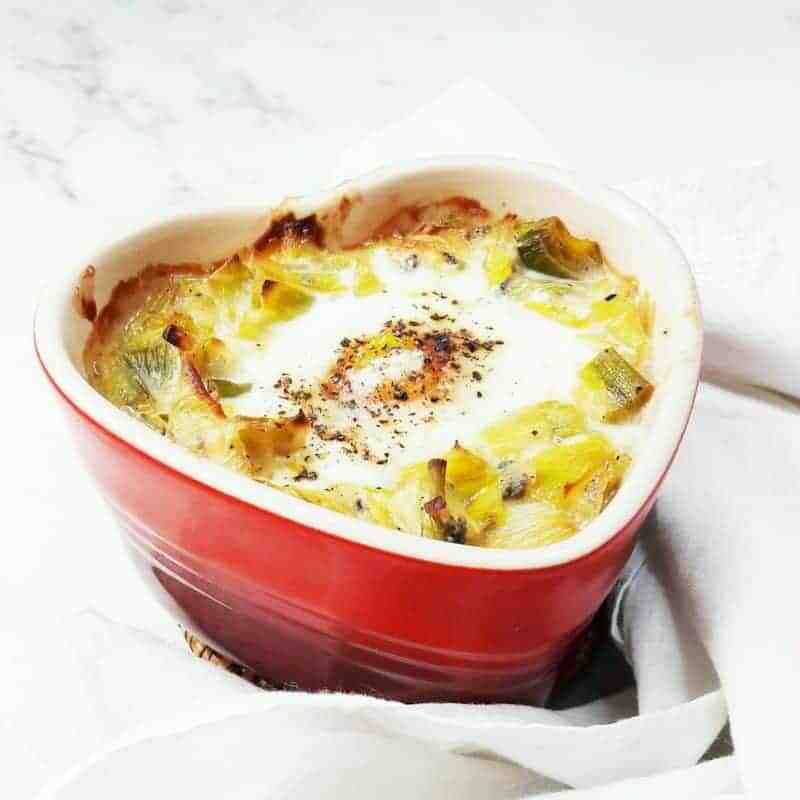 So I invited my friends, Alix and Hugo of A Hedgehog in the Kitchen to share one of their favorite recipes with us – and if your family isn’t impressed with this delicious recipe of Oven Baked Eggs with Leeks & Blue Cheese, I would be really surprised! What I love best is that Alix and Hugo use farm-fresh ingredients to create this dish – and they can ALL be grown in your backyard! 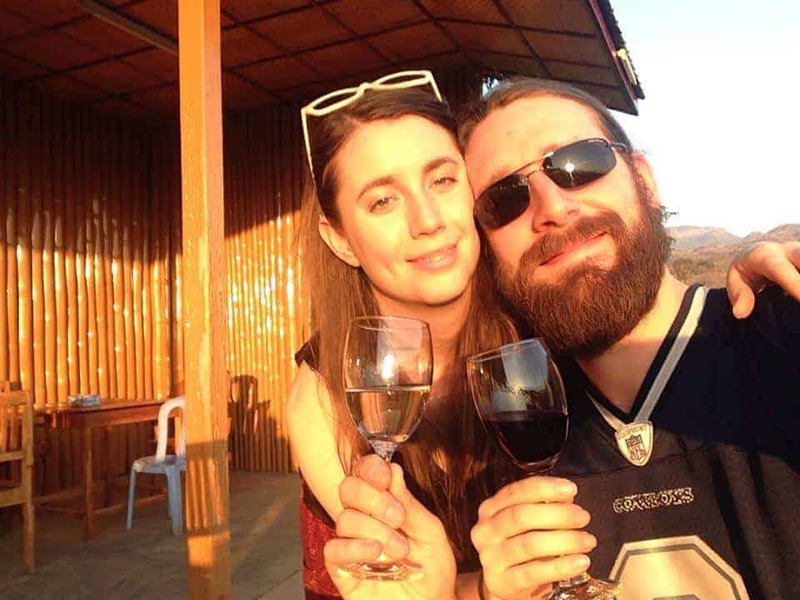 Please enjoy this recipe Alix & Hugo developed especially for FrugalChicken readers! These oven baked eggs with leeks and blue cheese are one of our coziest Winter meals. It’s very cold outside and this dish is welcome, healthy comfort food. We love cooking with eggs, they are an absolute staple of our diet. Here in Paris, we spend Sunday mornings at our local organic farmers’ market. We are lucky to have easy access to fresh, organic eggs. Our local organic market has inspired some of our best healthy, wholesome, real food recipes. The combination is really tasty. The eggs and blue cheese are filled with nutrients which makes this a high-energy meal. You can quickly throw these ingredients together and pop them in the oven to bake – quick and easy ! The combination and presentation are unique which makes this a fun dish to serve when you have dinner guests. This is real, healthy, wholesome, homemade food at its finest. We think leeks are really having a moment – at least in our home. We have really enjoyed adding these delicious veggies to several of our recent recipes. They taste wonderful with eggs. Eggs are one of our favorite ingredients because they are really versatile. They can be used in starters, main courses, side dishes and desserts. Locally sourced, organic ingredients are the perfect components of a wide variety of delicious meals. With some basic ingredients, you can create wonderful meals and experience food from other cultures as well. We created these little bowls of perfection using mini cocottes (little pots made of ceramic that you can place directly in the oven to bake). To make this recipe, prepare your leek and onion base. We used a small cast iron Dutchoven for this first step, but you can also use a small pot. Add some dry white wine and blue cheese to the mix. You can add a little bit of cream if you’re worried about the blue cheese flavor being too strong. If you love blue cheese like us, you can skip this step. Once you have preheated your oven to 390°F, line your mini cocottes with the leek, onion, wine and blue cheese mixture and prepare a small space for the egg on top. Bake in the oven for 10-12 minutes, depending on how well-cooked you would like your eggs to be. And voilà, your meal is ready ! If you are raising chickens and collecting eggs at home, this is an easy way to use them in a tasty dish with a little French flair. Eating a balanced diet with organic food is one of our priorities and I know it is one of yours too. Wash the leeks and cut them into julienne. Heat olive oil in a pan on medium heat. Add leeks, onion, a pinch of salt, pepper and herbs and cook for 5 minutes. Pour the wine into the mixture and cook until the wine has been absorbed. Add the blue cheese and cook until it melts. Taste and add the cream if the blue cheese flavor is too strong for you. Pour the mixture into 2 mini cocottes. Create an indentation to pour the egg into. Put the cocottes in the oven for 10 and 12 minutes (depending on how well-cooked you would like your eggs to be). If you enjoyed this recipe, please sign up to have our real food recipes with a French twist sent to you by email. 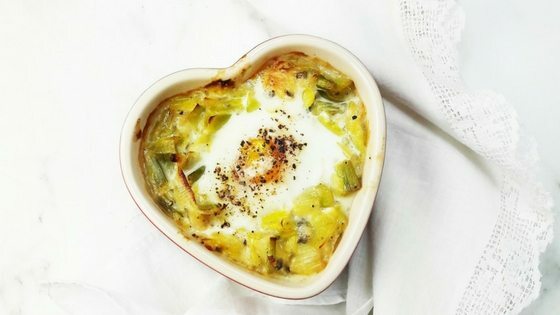 This recipe for oven baked eggs with leeks & blue cheese is perfect for a cold winter day or if you have family in town and want to impress them! Yum!